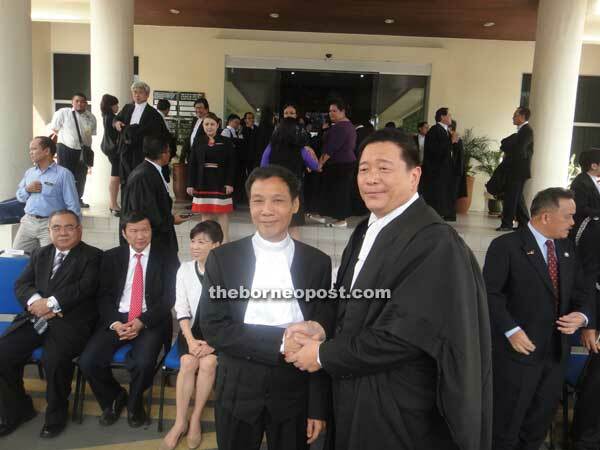 CONGRATULATIONS: Miri Mayor Lawrence Lai congratulates Chung (left) at the Miri High Court Complex. MIRI: A Judicial Commissioner with 25 years’ legal practice was recently elevated to High Court judge to serve in Sarawak. Over 80 lawyers from all over the country attended the elevation ceremony of Stephen Chung Hian Guan at the High Court here yesterday. “We have confidence that your Lordship will be able to strike a healthy balance between the need to dispose of cases within a stipulated timeframe, and to serve the needs of litigants,” said Advocates’ Association of Sarawak (Sarawak Bar) president Khairil Azmi Mohamad Hasbie in his speech to colleagues and well-wishers in Miri High Court chamber. First speaker at the ceremony, Khairil quoted ancient philosopher Socrates in stressing the need to satisfy litigants that they had heard fairly. “Four things belong to a judge – hear courteously, answer wisely, consider soberly, and decide impartially,” Khairil said. Three other speakers represented the Sabah Bar, Sarawak Attorney-General (AG) Office, and Sabah AG Office in offering their best wishes. Sibu-born Chung, 58, started his first job as temporary teacher in Sacred Heart Secondary School in 1973 where he was a student. He pursued further studies at University of Adelaide, graduating with Bachelor of Law in 1980 while working as an articled clerk, and was admitted as barrister and solicitor of the Supreme Court of South Australia, Federal Court of Australia, and High Court of Australia. On returning from Australia, he was admitted to the High Court of Sabah and Sarawak, joining the judiciary as a first class magistrate in 1981. In 1984, he resigned to venture into private practice, and was actively involved in voluntary work with various organisations for the past 25 years. Among his achievements were serving as AAS Sibu branch chairman and AAS vice-president (2004 to 2008), and starting a Legal Aid Clinic in Sibu. His last appointment was as Judicial Commissioner on Nov 2, 2009.